Karbon recently launched Karbon smart A34 , a dual SIM tablet with a 7 inch screen , a 1GHz cortex A9 processor and other basic features of a tablet. This tablet is yet another addition to overcrowded budget tablet market in India including Lava Etab Xtron plus, Micromax Funbook Talk P362, Solar pro tab HD tablet , Videocon VT7e5c, Zync Z99 2G, HCL ME connect V1 and many more. 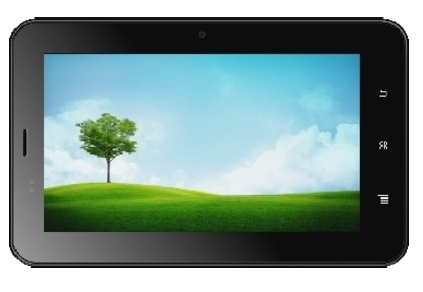 Lets talk about specifications of this tablet in detail to examine it according to our needs. The primary camera of the device is 2 MP which is standard in this price range . A front camera of 0.3 MP is also available for those interested in video calling. The O.S. used is android 4.0 (ice cream sandwich ) powered by a 512 MB ram, which is standard in this budget range tablets(Micromax Funbook Talk p362 tablet priced at 6990 INR provides 1 GB ram) . It provides a 4 GB ROM with internal storage memory of 2 GB which can be extended up to 32 GB using a microSD card. This tab has a processor with ARM architecture of cortex A9 with a good clock speed of 1 GHz., although many other tablets in the same price range, for example Micromax Funbook Talk P362 tablet , Solar pro tab HD tablet come with 1.2 GHz cortex A9 processor. We don’t know yet if its a single core , dual core or quad core processor as number of cores and the name of manufacturing company has not been specified by Karbon . Battery capacity of this tab is rated 3000mAh which is not optimum for a 7 inch screen. If you are a vigorous user than you risks running out of battery in three to four hours, and thus you have to carry your charger along with you through the day. Tab offers a medium size 7 inch capacitive touch screen with 800 x 480 pixels, which gives a pixel density of approx 133 pixels per inch which is average, yet standard in this price range tablets. (iPhone 5 has a PPI of 360) other display feature include pinch to zoom thus allowing you to zoom in and zoom out from your touch screen effectively. Lets compare this tablet to Micromax Funbook Talk P362 and Solar pro tab HD tablet, both of which we have discussed in details earlier. At the same price of 6999 INR Micromax Funbook Talk P362 offers 1.2 GHz cortex A9 processor instead of 1 GHz in Karbon A34. It also offers a better Android version Android 4.1 (jelly bean) and double RAM capacity with 1 GB RAM. Internal storage is slightly less at 1.65 GB but it is extendable to 32 GB using microSD card. It also supports 7 video and 4 audio formats whereas Karbon A34 supports 4 video and 1 audio formats and a micro USB. This tab has pretty nominal specifications with no single feature that particularly stands out. It will cater to your needs only when you are not a vigorous user. Even then Micromax Funbook Talk P362 priced at 6999 INR is a better option. If you can compromise on primary camera quality and don’t have to use your tab for making phone calls then Solar pro tab HD tablet Priced at 5499 INR is a better option.